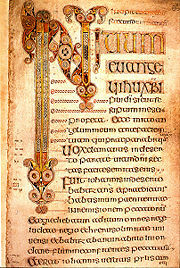 Beginning of a Latin Gospel of Mark, Book of Durrow (seventh century). The Gospel of Mark is an ancient koine Greek document that describes the life, persecution, and death of Jesus Christ, the central figure of Christianity. It is the second book of the New Testament, and one of the four canonical gospels, as well as one of the synoptic gospels, and is the earliest gospel to be written. Most New Testament scholars believe that both Matthew and Luke expanded their version of the gospel from Mark, while others hold Mark's gospel to be a condensed or abbreviated version of the Gospel of Matthew (Kealy, 32). It did not receive much scholarly attention until the twentieth century but has since been the focus of intense discussion, especially among researchers of the historical Jesus (Kealy, 198). Today, the Gospel of Mark remains one of the key scriptural documents of Christianity that inspires, guides, and nourishes the faith of Christians around the world. According to early Church tradition, c. 140 C.E., the author of the text is ascribed to be Mark the traveling companion of Paul, the apostle of Christ, and the interpreter of Peter, one of the disciples of Jesus (Harris, 102). This tradition is traced through Papias' (c. 70-146 C.E. ), bishop of Heirapolis, Exposition of the Oracles of the Lord which identifies Mark as Peter's interpreter (Brown, 158). However, within the text the identity of the writer is not revealed and the gospel is anonymous (Kummel, 95). Yet, while the identity of the author remains obscure, some hints about the author come forward within the gospel itself. The author confuses Palestinian geography by describing a traveling route in MK. 7:31, "Then he returned from the region of Tyre, and went by way of Sidon towards the Sea of Galilee, in the region of the Decapolis." The author describes this route as a direct route, which it is not. Sidon is approximately twenty miles north of Tyre and in the opposite direction of the Sea of Galilee. The Decapolis region is east of the Sea of Galilee and of Tyre and Sidon. This suggests that the author may not have visited the regions of Galilee or the surrounding area. Mark uses Latin versions of Greek words in 6:27, 7:4, 12:42, and 15:39,44-45 , and defines Aramaic words in 14:36 suggesting the author was multi-lingual (i.e., able to speak and write Greek, Latin, and Aramaic). Most scholars date the gospel between 65-70 C.E. based upon Mk. 13, Jesus' longest speech where he predicts the destruction of Jerusalem. Scholarship argues that this may be anticipating the events of the Jewish Revolt (66-73 C.E. ), as the description is vaguer in Mark than in Luke (Kee, 98), rather than writing after the events took place. This internal dating places Mark as the earliest written canonical gospel. The earliest manuscript for the gospel is found in the Chester Beatty collection, labeled papyrus 45 (P45) (Kealy, 10). This manuscript dates circa second century C.E. Two locations are suggested for Mark's composition. The first is Rome, which is the traditional location and is further suggested by the fact that the author uses Latinism (Bacon, 53; Brown, 161) and is writing to a audience that does not understand Aramaic (Bacon, 55). Further, as the gospel refers to suffering and persecution for Jesus' disciples (Mk. 13:13), it may be directed to the threatening social conditions that the Roman church was enduring under Nero's reign (Price, 124). The second location is Syria or Palestine, based upon the Mk. 13 and the emphasis of the Jewish Revolt (Harris, 102). The gospel has been characterized as a passion narrative with an extended introduction by scholars because one-third of the gospel narrates Jesus' final week in Jerusalem (Hauer and Young, 253). Mark divides his gospel around two geographical areas: Northern Palestine, which encompasses Galilee and adjacent areas, and Southern Palestine, which encompasses Jerusalem. Further, the gospel can be categorized into five basic parts (Harris, 106). The first part of the gospel (Mk. 1:1-1:13) begins with John the Baptist proclaiming the coming of Jesus (1:4-8). Following the proclamation, Jesus is baptized by John in the river Jordan (1:9-11). Directly after Jesus' baptism he spends forty days in the wilderness (1:13). John then gets arrested, and from that point Jesus starts his ministry in Galilee and begins gathering disciples (1:14-20). It is in the Galilean ministry that Jesus is portrayed as a figure of power, exorcising demons and performing miracles (Mk. 3:13-8:26); however, Jesus is itinerant during this period and commands demons and the healed sick to remain silent about him (Mk. 1:34). The Galilean people respond enthusiastically toward Jesus' ministry while the hostility of the scribes, Pharisees, and Herodians increase (Mk. 3:6). Jesus' family is portrayed as not believing in his teachings and attempt to restrain him (Mk. 3:21, and 31-35). Further, Jesus teaches in parables (Mk. 4:34), which are comparisons between two things (i.e., the Kingdom of God is like a mustard seed, Mk. 4:30-32), and describes everything in private to his disciples (Mk. 4:34); however, the disciples are portrayed as not understanding the significance of Jesus' teachings and miracles (8:16-21). The journey to Jerusalem is a transitional section between the activities in Galilee and Jerusalem (Mack, 391). It highlights a significance part of the narrative, which is Jesus' prediction of his persecution and death (Mk. 8:31, 9:30-31, and 10:32-34). This section once again highlights Jesus' power through the healing of two blind men (Mk. 8:22-26, and 10:46-52), while further depicting the disciples' lack of understanding (8:32-33, 9:32-34, and 10:35-40). The next major section narrates the events in Jerusalem. This section begins with Jesus' entry into Jerusalem, which takes place late in the day and appears less "triumphal" than in the other synoptic gospels (Mk. 11:1-11). Following the entry, Jesus "looks around" and returns to Bethany. The next he returns to Jerusalem, cursing a fig tree along the way for not providing him with fruit. The narrative then describes the "cleansing" of the temple courtyards, relates Jesus driving out temple-related businesses and over-turning money changers’ tables. Further, Jesus refuses to allow anyone to carry anything through the temple (Mk. 11:15-17). This disturbance causes the chief priests and scribes to plot against him, although, as he enthralled a large crowd, they were unable to act immediately against him (Mk. 11:18). In Mk. 13, Jesus prophesies the destruction of the temple, and highlights the suffering of his followers (Mk. 13:13). Jesus then takes his disciples to a private "upper room" where they observe a Passover meal. This meal is known as the "Last Supper," where at the conclusion of the meal Jesus breaks bread and pours wine to his followers explaining that the bread symbolizes his body and the wine symbolizes his "blood of the covenant" (Mk. 14:22-25). This meal is the origin of the Christian ritual for the celebration of the Eucharist or Holy Communion. It is also at this meal that Jesus tells his followers that one of them will betray him. The final events of the narrative has Judas Iscariot betraying Jesus to the chief priests, scribes, and elders (Mk. 14:43-50). Jesus is tried before the high priest of the temple, Caiaphas, (Mk. 14:53-72) and before Pilate, the Roman prefect who was watching over Jerusalem (Mk. 15:1-15). Mark portrays Pilate as trying to spare Jesus; however, the crowd demands that Jesus is crucified and a man called Barrabas who "was in prison with the rebels who had committed murder during the insurrection" is to be set free (Mk. 15:7). Jesus is then taken to Golgotha, and is crucified (15:16-47). The gospel concludes with Mary Magdalene, and Mary the mother of James, and Salome discovering an empty tomb and with a young man in a white robe explaining that Jesus is raised and that he is "going ahead of them to Galilee." The women flee and say nothing to anyone, because they were afraid (Mk. 16:1-8). Ancient manuscripts provide two other endings to the gospel. The shorter ending, which has the women explaining what happened to them to Peter, and a longer ending which describes Jesus' resurrection (Mk. 16:9-20). Scholars agree that the shorter and longer endings do not conform to the same compositional style of Mark's gospel, and were later editions (Kummel, 99). It is thought by scholars that Mark developed his gospel out of pericopes, or individual story units written down by early followers to preserve Jesus' sayings and actions, which he strung together to create a narrative. Scholars understand these pericopes as being generated out of the oral transmission of the early followers, and they are the foundation for Mark's gospel (Kelber, 44). It is in the literary feature of the intercalation that this editorial process is best displayed. Intercalation is enclosing one narrative within another. An example of an intercalation in Mark is Jarius' daughter and the hemorrhaging woman (Malbon, 39) found in Mk 5:21-43. This intercalation has Jesus going to Jarius' house to heal his daughter, during which time a woman interrupts Jesus' journey because she needs healing from a twelve year hemorrhage. The story concludes with Jesus curing the girl. The inserted story portrays the woman as possessing a great deal of faith in Jesus' ability. Mark has taken two stories and molded them together in order to make a theological point about faith. Other literary characteristics of Mark’s gospel are the use of a dualistic structure, parallel structure, two-step progression, and three-step progression. Dualistic structure is where Mark connects two elements in order to emphasize points (Fowler, 100). An example of this is in Mk 4:45-5:1 where he connects the words wind and sea together to emphasize the elements in the storm. Parallel structure is where Mark connects two stories as in Mk. 4:35-5:1 and 6:45-53. This emphasizes the similarities of the stories, and recalls to the listener or reader the earlier episode. The two-step progression is where Mark clarifies and adds precision to his narrative (Rhoads and Michie, 47-49). He explains a general idea and then refines it. An example is in Mk. 5:1, “They came to the other side of the sea, to the country of Gerasenes. Finally, the three step progression, where Mark repeats the same material creating a pattern of actions or events (Rhoads and Michie, 54). An example is of the repeated prediction that Jesus will suffer and die in Mk. 8:31, 9:30-31, and 10:32-34. This is used to both recall and reinforce to the listener/reader the importance of the event. One theme to Mark's Gospel, discovered by William Wrede in 1901, is the Messianic Secret, where Jesus does not want his status as Messiah revealed and warns both the people he healed and demons not to tell anyone about him (Mk. 1:34, 44; 3:12; 5:43; 7:36; 8:26; 30; 9:9). The idea of the Messiah in Ancient Judaism is of a ruler or king, and not of a person who is persecuted, suffers, and dies. Thus, Mark develops the idea that Jesus cannot be fully understood until after his mission in order to show that Jesus, the Messiah, must undergo persecution, and crucifixion. One of the main titles attributed to Jesus in the "Gospel of Mark" is the “Son of Man.” Some scholars theorize that the use of Son of Man as a title may be prominent in Mark because this was the self designation of the historical Jesus. For Mark, Son of Man has three basic forms: an earthly figure who teaches with authority; a servant who embraces suffering; and a future eschatological judge. As an earthly figure, Mark represents the Son of Man as possessing the ability to forgive sins (Mk. 2:10), and to be the Lord of the Sabbath (Mk. 2:27). The Son of Man as a servant who must undergo persecution, suffering, and death is found in Mk. 8:31, 9:12, 9:31, 10:33, 10:45, and 14:41. The eschatological judge characterization of the Son of Man is found in Mk. 8:38, 14:26, and 14:62 where the Son of Man comes in glory of the Father and holy angels and will be sitting at the right hand of power. These three characteristics may seem opposed to one another (i.e., one who suffers and also one with power); however, in the gospel, Mark explains that these three characteristics actually come together in the character Jesus and understood in proper context, that of the resurrection, that the characteristics actually work together. A second title attributed to Jesus in Mark is “Son of God.” There are references to Jesus as God’s son in Mk. 1:11, 3:11, 22-28, 5:1-13, 15:39. However, this title is not used as much by Mark as the title "Son of Man." In fact, some manuscripts do not include the title Son of God in Mk. 1:1. It may be that Mark uses the title Son of God to create an ironic contrast between those that understand that Jesus is God’s son, like the unclean spirits in Mk. 3:11, and those who do not understand who he is, like the disciples in Mk. 4:41. Bacon, Benjamin. Is Mark a Roman Gospel? London: Harvard University Press, 1919. This page was last modified on 4 March 2013, at 16:37.